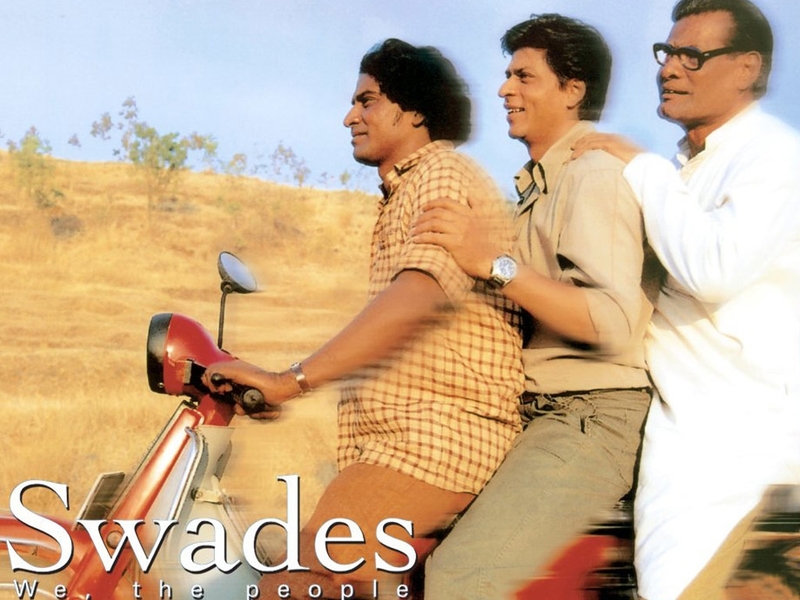 Sunday ReRun: Swades! Because I Am Also on Vacation From Regular Life in a Warmer Climate! Swades! It’s really good, a bunch of you have seen it multiple times, I don’t feel bad reposting this review while I am out having fun with friends in sunshine. This entry was posted in Uncategorized and tagged Sunday Rerun, Swades by mredlich21. Bookmark the permalink. “There is a certain kind of loneliness, the man who has achieved everything but still wants a family, which sneaks through from his reality to his film roles if there is the smallest opening. And if there is a requirement of the character to have that strange melancholy in him, as in this one, it comes flowing out and cannot be stopped.” —This is a very interesting passage. I think whenever you explain or review Shah Rukh, this should come up. He is someone who didn’t leave (though if his sister had been well enough to marry he might have gone overseas), who has a very loving family, but whose core loneliness is ever-present. Yes, and I am thinking about how he interacts with the public, I think this is related too. He goes through phases of opening up way way further to interviews, and on twitter and other forums, than any other public figure does. In a way that feels like someone reaching out for a connection because he is so lost and alone. And then he has other phases of shutting down, like he has to isolate himself because he doesn’t know how to let anyone in. It’s something I’ve seen in people I know in real life who have that kind of background, an ebbing and flowing of intense intimacy and completely shutting out the world, because they are missing the kind of balance you get from having people in your life that know and love you for who you are. I think you are right and I think one of the things we know nothing about are the ebbs and flows of his sister’s health. Some of his withdrawal times might be connected to that. When the whole PC idiocy was going on and he was silent which people took as guilt, was exactly when AbRam was conceived, the surrogate was pregnant ( a very fraught time for the parent; I’ve been through it with friends) and then AbRam was premature and they were concerned for his life. He withdrew because of his LIFE; not nonsense gossip. But it also has to do with this need for mass love and intimacy and fear of it. You got that so correctly, I think. The actor that played the fakir is a fascinating study. He, Makarand Deshpande, also appeared in the TV serial “Circus.” He played a Fagin-like character in Prabhas’ ” Ek Niranjan” and the wicked clarinet player brought in to defeat the local band in “Amen.” As a director, he directed “Shahrukh Bola “Khoobsurqat Hai Tu” ” which featured an extended cameo by Shahrukh Khan. And, years ago, he was engaged to Sanjana Kapoor, the daughter of…. (wait for it)…..Shashi Kapoor. He is also considered something of a legend in Indian theater. He writes, directs and acts in all the different Indian formats. The only thing he doesn’t do is tame that wild mane of hair. It really deserves it’s own listing in the movie credits. Shahrukh Bole Khoobsurat Hai Tu is the only Shahrukh film I do not own and have not watched. It’s impossible to get, so far as I can tell. It’s on youtube but, alas, without subtitles. Its not an extended cameo; it is less than a minute at the beginning and another 30 secs at the end.